"Ralph had a natural home run swing. All he needed was somebody to teach him of the value of hard work and self-discipline. Early in the morning on off-days, every chance we got, we worked on hitting." "He was one of the truly great hitters, and when I first saw him bat, he made my eyes pop out." ^ Steven R. Bullock (2004). 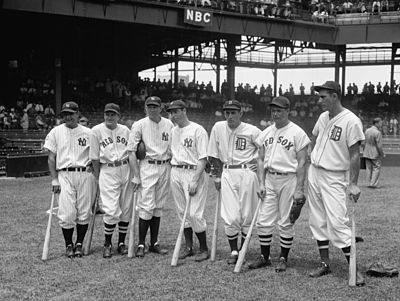 Playing for Their Nation: Baseball and the American Military During World War II. University of Nebraska Press. pp. 127頁. ISBN 978-0-803-21337-1. ^ Peter S. Horvitz、Joachim Horvitz (2001). The Big Book of Jewish Baseball: An Illustrated Encyclopedia & Anecdotal History. S.p.i. Books. pp. 80頁. ISBN 978-1-561-71973-0.